Charles Marriott was a former England international and captain who also served as secretary of the Rugby Football Union. His own term of office, from 1907, was characterised by a strong alliance with the most important RFU politician of the time - William Cail, treasurer from 1894 onwards. That they retired together in 1924 signified the end of an RFU era that began with England homeless and without a championship since 1893 and ended with five Grand Slams in seven seasons and Twickenham grown to a capacity of more than 60,000. EHD Sewell reckoned that 'He had everything to do with the raising of Twickenham from her most difficult 'cabbage patch' stage to an assured GHQ of the game and in my opinion has never received enough kudos for his labours'. Marriott was the second paid RFU secretary, succeeding after the short and ill-starred term of office of Percy Coles. He was clearly formidable, and doubtless needed to be when you consider that his contemporaries at other unions included Walter Rees, who steered a path through Welsh rugby politics for more than half a century, and Scotland's James Aikman Smith, the unbending scourge of all that smacked of professionalism and a martinet quite prepared to cuttingly contradict King George V when the monarch expressed an opinion with which he disagreed. Marriott's playing career would have merited a footnote in rugby history even if he had never held an administrative role. He was a native of Suffolk, but his path towards rugby was set when he was sent to Blackheath Preparatory School, whose former pupils formed perhaps the most important recruitment stream for Blackheath, the dominant club side of English rugby's early days. Owen's somewhat euphemistic description of him is as a forward of 'fine physique and lively temperament'. Going up to Cambridge in 1880 an ankle injury kept him out of the university side and meant that, on recovery, his first impact was as an opponent - playing early in the 1881-2 season in a Blackheath team that beat the university heavily, with the forwards doing most of the damage. Marriott was summoned to a meeting of the university team to explain Blackheath's superiority. He recalled 'This was not a hard task as the visiting forwards owed much of their success to the clever way in which, directly the ball was put down, they rushed it to one side or other of the scrummage and broke away in a body. This style of play was new to the Cantabs, who knew of no other style than that learnt in the big side games at school, of pushing in the scrummage whether on the ball or not, and never dreaming of utilising the feet'. Cambridge immediately adopted the more sophisticated combined forward game. It was not sufficient to bring them success against Oxford, which was ahead of them in adopting a game that combined forwards and backs and also had perhaps the most brilliant crop of players in their history. But at a time when the universities were immensely important to the development of the game, Marriott's role as an intermediary was vital. And as well as adopting Marriott's ideas, the university team imported him - giving him three blues and the captaincy in 1883. David Frost's history of the Varsity match credits him with reorganising Cambridge rugby to ensure effective college competition and talent-spotting, although he was never on a winning side against Oxford. He also led the campaign to get rugby admitted as a full blue sport. In his final year he was picked for England, playing all three matches in their second Triple Crown season. 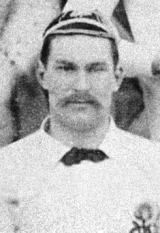 He played seven times in all, leading England twice in 1886 when incumbent Temple Gurdon was unavailable, but was discarded after the only defeat among them - England's first ever loss to Ireland in 1877. He was to enjoy a varied life. Historian Tony Collins picks him out as the only England player ever to describe himself simply as a 'landowner', but there were also periods in teaching and - during the First World War - as one of the oldest junior officers in the British army. While in office at Twickenham he set up the Rugby Football Annual, which reigned as the game's most important reference work until the second World War, and after leaving he worked in the city. He retired at length to his native Suffolk, where he died in 1936. The Cambridge alumni register also records him as having 'travelled frequently with dipsomaniacs'. Whether this was charity work, or a donnish joke about the habits of players on rugby tours, is sadly unclear. One suspects that with Marriott either was equally possible.